When you look at a menu, walk down a grocery store aisle, or even open your refrigerator, you might see many types of alcoholic and non-alcoholic beverages. Sometimes, the variety may be staggering. It is important to understand the different varieties and types of these beverages, and the effects they may have on your health. At the most basic level, a beverage (a drink) is a type of liquid that you can consume for sustenance, energy or hydration. For hundreds of years, the idea of a beverage was likely restricted to water or milk and perhaps juice squeezed from fruits. Then came alcohol, wine, various teas, coffees, cocktails, cocoas, ciders, and sodas. The vast variety of beverages that we now have available to us means that we can satisfy our thirst or cravings in countless different ways. Depending on the lifestyle or health profile you want to lead, you may lean more towards certain beverages than others, but before you make any decisions about the types of beverages you consume, you should know a few things about each of them, as well as their benefits or possible harmful effects. A non-alcoholic beverage is a drink that contains no alcohol. In the US, a drink which contains less than 0.5% alcohol by volume is also termed as a non-alcoholic drink, such as low-alcohol beer and apple cider. From freshly squeezed orange juice to chemical-packed energy drinks to teas and coffees, the spectrum of non-alcoholic beverages is broad. Non-alcoholic beverages can be broadly categorized into soft drinks and hot drinks. Soft drinks are drinks which do not have alcohol such as carbonated drinks, tonic water, fruit punch, and sparkling water, among others. Hot drinks include popular beverages such as coffee and tea. The most basic beverage on the planet is also the most important. Without water, every human being on the planet would die. Since we are composed of more than 70% water, it makes sense that staying hydrated is important! Water can come in various forms – sparkling, tap, still, bottled, etc., and is the lubricant for all of life’s processes. One of the most natural substances in the world, milk is produced from the mammary glands of certain animals. Commonly consumed forms of milk come from cow, goat, sheep, buffalo, camel, donkey, horse, reindeer, and yak, although some of these are less found than others. Animal milk is typically suggested to be consumed by animals of the same species (e.g., goat’s milk is best for goats, etc. ), but there are significant health benefits when humans drink different kinds of animal milk. Many of them are high in minerals and unique compounds that can help build strong bones and improve immunity. Each type of animal milk, however, should be considered individually based on its nutrient profile. When you pour boiling water over certain types of leaves, herbs or other substances, you can create a tea. This drink is primarily composed of water, but infused with the various nutrients, vitamins, minerals, and antioxidants found in the tea “leaves”. Tea comes in many different forms, including black, green, white, oolong, and pu-erh. You can also make tea from various herbs and spices, like cinnamon, honey, pine needle, chamomile, echinacea, and many others. Each tea variety promises certain health benefits by delivering specific antioxidants, organic compounds, as well as varying amounts of caffeine to the drinker. The most common benefits of tea are reduced inflammation, lower anxiety and stress levels, better sleep, respiratory improvement, an immune system boost, and increased antioxidant activity to defend against chronic diseases, like cancer. Similar to tea in its preparation, coffee is made by pouring boiling water over ground coffee, which comes from coffee beans. This is a rather straightforward beverage and is found throughout the world. It is primarily used as a stimulant, and billions of cups of coffee are consumed every year around the world due to the high levels of caffeine found in this beverage. Roasted coffee beans can come in many different varieties, flavors, and intensities, which is why there are thousands of different coffee blends. Most of the coffee beans have a moderate amount of B vitamins (pantothenic acid and riboflavin), and trace amounts of potassium and manganese. Caffeine can be addictive, so it is important to regulate your coffee intake as too much can negatively affect your nervous system and stomach. Carbonated beverages are beloved by children, but many parents are wary of allowing their children to drink too much “soda” or “pop”. Coca-Cola, Sprite, Pepsi, Dr. Pepper, root beer and so many other sodas are out there on the market, and most of them are packed with sugar and sugar substitutes. There are no real health benefits to soft drinks (aerated drinks), except for the caffeine boost that it can occasionally provide. Soft drinks tend to have no vitamins or minerals and they contain carbohydrates exclusively in the form of sugar. Juice can come in as many varieties as there are types of fruits and vegetables. From orange juice to beet juice, freshly squeezed to concentrated, juices play a huge part in our daily lives. 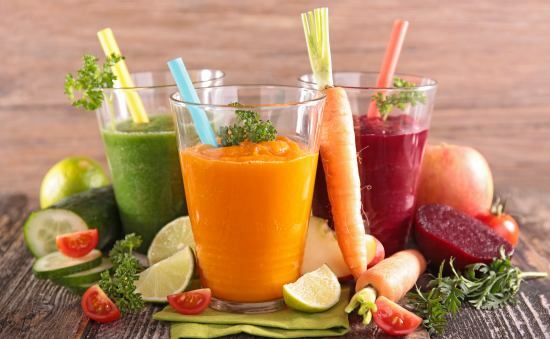 Fruit and vegetable juices are not only refreshing but also very good for you due to their vitamin and mineral content. In fact, some fruit juices have such concentrated nutrients that you can fulfill some of your vitamin and mineral needs with a single cup! That being said, many fruit juices are altered with additional sugars and other additives, either fillers or flavorings. Depending on the source of the juice and the purity, the nutritional content may vary. Most juices are rich in vitamins and antioxidants, including vitamins A, C, and D, as well as magnesium, calcium, potassium, and phosphorous. However, the actual juicing process causes most of the dietary fiber to be kept out of the juice itself, which makes it slightly less beneficial than simply eating the fruit alone. The recent craze over energy drinks is understandable in our fast-paced world, but many of these supercharged beverages can be hazardous to our health if drunk in excess. They tend to have slightly less caffeine than an average cup of coffee, despite how they’re marketed, but that isn’t the main problem. While they may give you a healthy energy boost, some of that boost comes in the form of sugar, because there is a lot of it in most of the energy drinks. So, while the caffeine can pick you up, the sugar crash that occurs later can be quite severe. This beverage is a mixture of two or more juices and other soft drinks. They are similar to cocktails but with one major difference; mocktails are non-alcoholic. It derives its name from mimicking cocktails, thus the word ‘mock’. Some also prefer calling it ‘punch’ or virgin cocktail. This drink is ideally suitable for pregnant and lactating women, children, as well as recovering alcoholics. In order to enjoy its major health benefits, make sure you do not overload it with sugar and calories. A healthy and tasty mocktail will ensure an improved gut health, boosted immunity, and well-hydrated body to name a few. This frothy beverage is basically a cold drink made of milk. It is sweet in taste due to the presence of fruits or chocolates, sometimes ice-creams too. They are comparatively thinner than their smoothie counterparts, which usually have more calories too! Recently, protein shakes have been in trend as a pre and post-workout drink as it helps boost energy, repair muscles, and provide the much-needed fiber and protein. A smoothie is a blend of fruits, vegetables, milk, yogurt, ice-cream, and other foods. It is a thick beverage, usually sweet, and enjoyed chilled. It is sometimes used interchangeably with milkshakes but smoothies are comparatively thicker and contain more of yogurt and ice-creams. Depending on the ingredients used, smoothies can have a wide range of benefits. In general, they provide a large amount of protein and help in better digestion. Green smoothies also aid in lowering blood pressure levels. Cocoa contains hot water or milk mixed with cocoa powder and shaved or melted chocolate. Sugar is also added to some kinds of cocoa as a sweetener. Generally, cocoa is considered a sweet treat, and not a healthy beverage, but there are an impressive amount of surprising benefits in it. The cacao plant, from which cocoa is derived, possesses a number of antioxidants and organic acids, doing everything from improving blood flow and reducing cholesterol content to preventing chronic diseases and boosting cognition. This carbonated, bitter-flavored soft drink has quinine (a bitter alkaloid) dissolved in it. It is often added to alcoholic drinks, especially gin and vodka. Some prefer to call this as flavored soda water. Certain varieties of tonic water contain a high amount of sugar and a bit of fruit, making it a big bag of carbohydrates. However, the pure form of tonic water has some health benefits due to the presence of quinine. These benefits include anti-inflammatory effects, muscle relaxation and treating malaria. But remember, everything in moderation! An alcoholic beverage is any drink which contains ethyl alcohol or ethanol. They are broadly divided into three categories: beers, wines, and spirits (hard drinks). Beer is likely one of the oldest beverages on the planet and is certainly the first form of alcohol. Made by the fermentation of starches – cereal grains, rice, corn, maize, etc. – beer was probably made by accident at some point in ancient history and has now become a global phenomenon. It is most people’s favorite way to relax after a hard day of work. Beer isn’t generally considered a healthy beverage, due to its relatively high-calorie count. However, there are B vitamins, along with potassium and magnesium in most varieties of beer. Depending on how each beer is brewed, there is an infinite number of unique nutrient profiles, but most are primarily made of carbohydrates and small amounts of protein. Another ancient beverage, wine, is made by fermenting grapes, just as beer is made by fermenting starches. This fermentation process is what gives these beverages their alcohol content. Wine comes in two primary varieties, red and white, but depending on where the grapes are grown in the world, the soil content and the cultivation process, the flavors and unique nutrient profile will be different. Most wines possess high levels of tannins, antioxidants, and phytochemicals that are derived from the skin of the fermented grapes. This can make wine helpful for lowering the risk of chronic diseases like cancer, chronic stress hormones, and other unsavory medical conditions. Fermented grains and grapes make up beer and wine, but fermented apples are the source material behind cider, another very popular alcoholic drink. Those prepared from fermented pears are called perry. Apple cider, also known as hard cider have very few health benefits due to the low levels of vitamins and certain minerals that remain from the apple. High concentrations of antioxidants from the apple also make hard cider somewhat healthy for those who drink it in moderation. Cocktail is a mix of alcoholic drinks such as gin, vodka, whiskey, or brandy combined with fruit juices or other liquors. It is usually served chilled. Cocktails are usually made with high-calorie mixers, so if you are watching your diet, you need to be careful not to have too many of them. Spirits, liquor or hard alcohol – whatever you want to call them – these are the most potent forms of alcoholic beverages, often exceeding 40% alcohol by volume. Whiskey, vodka, gin, tequila, rum, soju, brandy, and countless others are all forms of alcohol, but they are concentrated in strength because they are distilled versions of fermented products. This makes them much more powerful and intoxicating for consumers. The distillation process tends to eliminate any of the possible nutrients from these types of alcohol, but studies do show that occasional drinking in moderation can be good for your immune system and heart health.